Batlle, C.; Gomis, J.; Pons, J.; Roman-Roy, N.
The equivalence between the Lagrangian and Hamiltonian formalism is studied for constraint systems. A procedure to construct the Lagrangian constraints from the Hamiltonian constraints is given. Those Hamiltonian constraints that are first class with respect to the Hamiltonian constraints produce Lagrangian constraints that are FL-projectable. 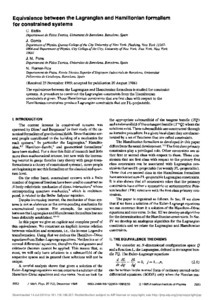 Batlle, C., Gomis, J., Pons, J., Roman-Roy, N. Equivalence between the Hamiltonian and Lagrangian formalisms for constrained systems. "Journal of mathematical physics", Agost 1986, vol. 27, núm. 12, p. 2953-2962.